With KitchenHub you can add many different online ordering services and expand your business to grow your bottom line. 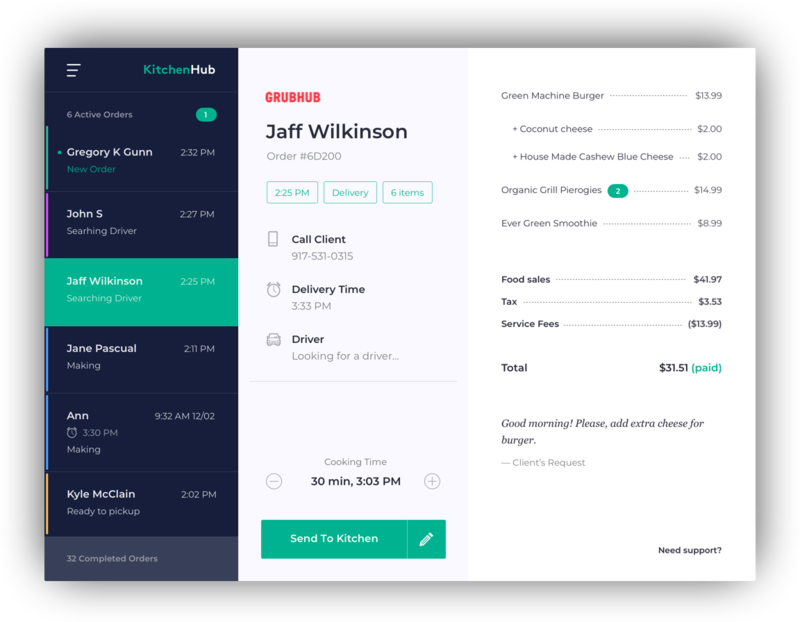 When you fire a KitchenHub app, you'll land on a single streamlined dashboard with all your online orders. Our smart interface will make management of online orders simple and efficient. KitchenHub makes online ordering easy. There is no need to hire additional person to manage online orders. It means annual savings of approximately $43000. Forget a mess of an array of different devices, emails and faxes. No more manual orders re-enters in POS and handwritten kitchen notes. Now you can easily manage your online orders in one dashboard and print directly from it. We made KitchenHub app simple to use with easy and straightforward set up process. Most customers can set it up themselves and start using it right away. KitchenHub has a transparent pricing: you pay one flat monthly fee and that is it. No hidden fees or extra charges. Just sign up, set it up and start saving time and making money.